Is “image size” the size of the paper I paint on? No, “image size” refers to the size of the painting as seen through the opening in the mat. SW rules state that is must be at least 12 inches minimum. A painting done on a quarter sheet of watercolor paper would not qualify. Can I use a colored liner? No. For exhibition purposes the matting must be white or off white. I have a frame that is 2 inches wide. Can I use it with my painting? No. 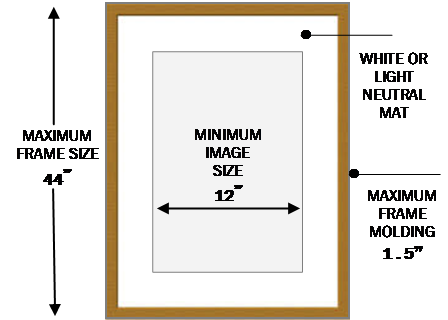 According to SW rules, framing must be no larger than 1 ½ inches. The frame must be simple with no decorative corners. It is the painting that is most important in an exhibition, not the frame. Can I use a dark stained wood frame? Yes. It must be plain in character. You may also use a simple wood frame that is painted black. Artists participating in the juried competition must be 2019 members of the Southern Watercolor Society and reside in the District of Columbia or one of the following southern states: Alabama, Arkansas, Delaware, Florida, Georgia, Kansas, Kentucky, Louisiana, Maryland, Mississippi, Missouri, North Carolina, Oklahoma, South Carolina, Tennessee, Texas, Virginia or West Virginia. Members in good standing who have moved from these states remain eligible. Dues are $30.00 and may be paid online at www.southernwatercolorsociety.org . Also at the end of the online application, applicants will have the choice of paying the application fee plus membership dues ($65.00), or only the application fee ($35.00) if membership dues have already been paid. Artwork submitted must be original as stated below. If a painting is discovered to not be an original, the SW Board will immediately withdraw the painting and/or award. Membership and exhibition suspension will be a minimum of two years. Please use honorable ethics concerning originality. SW reserves the right to refuse, upon arrival, any painting of unacceptable quality or damaged in shipment. A painting that does not match its submitted digital image will be returned. Paintings must be original in composition / design and not copies of other artist’s work, including photographs by persons other than the artist. Paintings started or completed under supervision in a workshop are not eligible to enter. Paintings are limited to water-based media, painted on paper, watercolor board or YUPO, unvarnished. (no water soluble oil or pastel products). Collage is acceptable if it consists only of paper painted by the artist (no newsprint, photos, digital images, giclées, 3-D objects, gold leaf or metal). Image size showing through the mat may be no smaller than 12” in either direction. Framed size maximum is 44” in either direction. All works must have been completed after MAY 2017 and not have been accepted into previous SW exhibitions. This is very important to check your dates of completion before entering. Juried paintings will be rejected and returned to the artist if they do not conform to the above specifications and the presentation guidelines stated below under PRESENTATION. Judy Morris will instruct a 3-day workshop, “Painting Should Be Fun,” for the Southern Watercolor Society, May 29 through May 31, 2019, at the Kerr Arts and Cultural Center, Kerrville, TX. in conjunction with the 42nd Southern Watercolor Society Annual Juried Exhibition. The cost of the 3-day workshop is $250. Maximum attendance will be 20 participants. Register now! Contact: Event Chairperson to receive an application and supply list. A deposit of $100 must accompany the application. The balance must be paid by April 1, 2019. Mail the application and check, made out to the Southern Watercolor Society, to Jeanne Heise, Event Coordinator, 38 Indian Springs Dr., Kerrville, TX 78028, jeanneheise@aol.com , 830-896-9593. Rename the image with the entry number 1 or 2 then the correct title for the painting (1-Joyful Smiles). Since the image will be uploaded to your JAS account, do not add your name. JAS will assign an identification number. SW reserves the right to reject any juried painting that is noticeably different from the JPEG image or does not comply with entry specifications. Failure to follow these guidelines will result in return and/or disqualification for awards. In the event a painting is received damaged the artist will be notified for further actions to be taken. Painting image a minimum of 12 INCHES per side, length and width, as viewed within the mat opening. White or light neutral (no colors or black) with painting image visible within the opening of the mat. Maximum size frame cannot exceed 44” x 44”. Use simple, smooth, unadorned wood OR plain metal in black, gold or silver. Painting must be protected with Plexiglas or an acrylic glazing sheet. NO glass. Frame must be ready to hang with wire in place. Kerr Arts & Cultural Center requires a handling fee in the amount of $25.00 for shipped paintings. There is a $10.00 handling fee for hand delivered paintings. Accepted paintings must be shipped in a reusable box via UPS or FedEx including PREPAID return shipping labels. Return labels must include a bar code. Shipping artwork in Airfloat or U-LINE boxes is strongly recommended. NO wooden boxes. NO screws or nails. NO peanuts. Please print your name boldly on the outer flap for easy recognition for packing. COMPLIANCE CHECKLIST REQUIRED: If your painting is accepted, please complete, sign and attach the Compliance Checklist located in the shipping directions with your acceptance notice. Please attach the form to the left, top corner. In the event a painting is returned to the artist, you will be notified by email or phone either by the venue or a SW representative. The Kerr Arts and Cultural Center (KACC) will retain a 30% commission deducted from the sales price quoted by the artist. The venue will collect and remit sales tax and other applicable taxes on sales. KACC will pay 70% of the selling price to the artist by July 15, 2019. All participating artists will be required to provide tax identification numbers to the venue. Works sold will remain in the gallery until the completion of the show. KACC will make arrangements for delivery of the artwork to the purchaser at the purchaser’s expense. Failure to submit an accepted painting. Submission of artwork other than the one that was juried into the SW Exhibition. Submission of a painting already accepted in a previous SW show. The Southern Watercolor Society has adopted the following policy relating to acceptance/display in any juried exhibition: “Any SW member who attempts to influence, intimidate and/or harass a judge, exhibitor, Board member, or exhibition committee member can be banned from the current show and from future entry into SW exhibitions by a vote of the Board. The juror’s decision will be final for the accepted paintings as will be the judge’s decision for awards.” SW membership dues must be current for 2019 to be eligible for the exhibition and/or receiving an award.